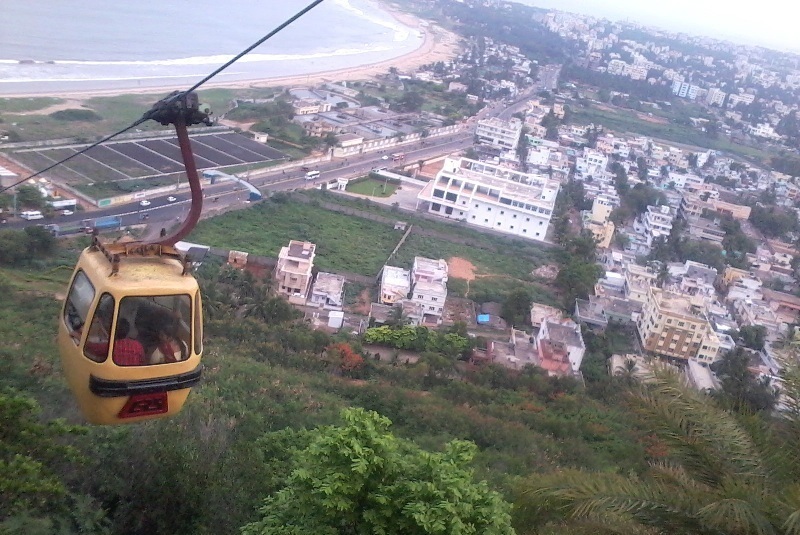 “Vishakhapatnam”, formerly known as “Vizag”; the name in itself is sufficient to flood the memory with the pictures of ships, lighthouses and ports. Apart from being the largest port by volumes in India, Vizag has also been blessed with picturesque beaches and numerous tourist attractions. No wonder it is one of the hot favourite tourist destinations in southern part of India. "Kailasgiri" park is one such spot. Facing the sea, sitting atop a cliff, as the name suggests, the mere look of Lord Shiva and Goddess Parvati's giant statues provides a rich nutrition for a devout's soul. One can hire a taxi, take a walk or enjoy the rope way ride to reach the top of the hill. Taking the rope way, however, has its own charms as you get to see the bird's view of the spectacularly clean beaches and capture them. With a nominal charge of Rs 66 per head, rope way is indeed worth all its money. Believe me, Mother Nature is in its full grandeur here. It will take you long if you go around the hill on your foot. Rather take a trip down your childhood. Toy Train.... Anytime. Take a ticket, place yourself comfortably and just let your fingers keep the camera shutter busy. I was already falling in love with the beaches and I am sure you will too.. Sometimes we are too demanding, the more we get the more we want. With some daylight still on our side, we decided to drive to "Bheemlipatnam", 35 km. from Vizag. Good times it seems were just starting. India is blessed with numerous places worth watching. Most of these could be hidden in small and little-known towns and villages, which even the most acclaimed of the tourist circles might have no clue about. These are the places which provide for quick refreshment to voyagers' souls while treading his/ her way to and from places of larger tourist interest. Whenever you come across such spots, you tend to realize that the next one is more beautiful than the previous one. Good thing that every nook and corner of this country is filled with such interesting places, however for these graph never seems to take a plunge. 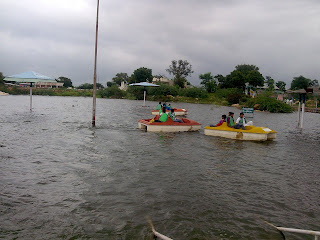 Thanks to Dipak Sir, we got a chance to check out this lovely spot called "Bheemlipatnam". The caricature at the entrance says a lot about the place. 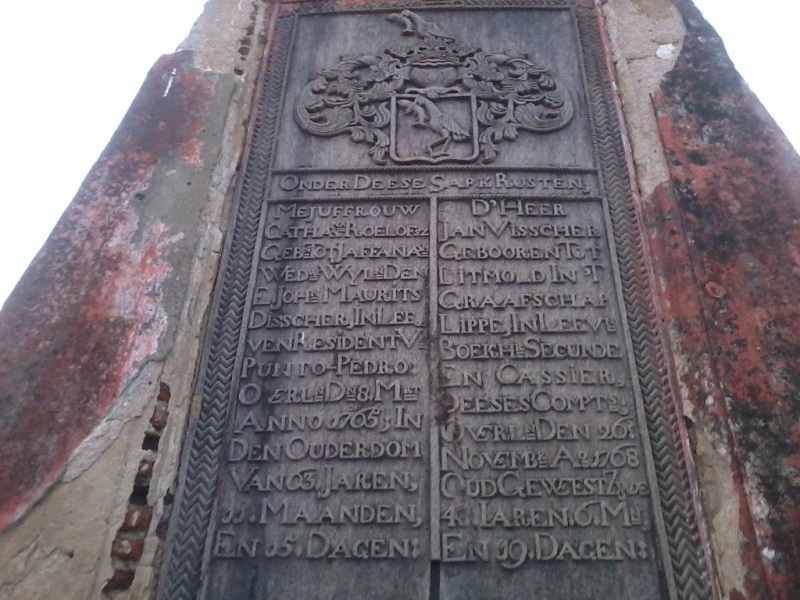 Being a Dutch colony, that European influence is quite evident in the architecture of Bheemlipatnam. It was established in the 16th century when the Dutch settlers thought of making it into a beautiful trading centre. 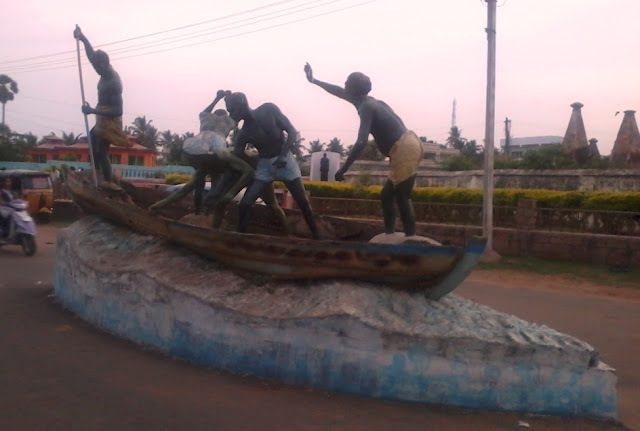 As the locales told one, this town of Bheemlipatnam was once ruled by the Pandava Kings. Were we really standing in the kingdom of the "Pandavas"? Well, for a change, let us stop straining our historical knowledge base and appreciate the pristine beauty of this port town. For, it is worth every bit of it. Standing on the beaches, the might of Bay of Bengal seemed to be both tempting and challenging us to test its waters. Alas! Civilization has some flaws too. Being in company of colleagues and without a set clothes to fall back on, I was every bit hesitant to take the dip in the vastness. Struggling with my thoughts, wisdom suddenly struck. "I do not know if I will ever get a chance to visit this amazing place again". So be it! The very next moment I was enjoying to the fullest -- the sea and its waves. As I always say and believe "Good travelers never think themselves to be foreigners". The long stretches of the beaches along the port are some of the most beautiful in the region. Calm and serene Bheemli Beach (aka Bheemunipatnam Beach) makes an ideal stopover to relax and recharge your spirits. As the place is hardly known to the outside world, its beaches are yet to be exploited by the bitter truth of modernization. Relatively clean, hence, a long walk along the beach is a soothing experience. 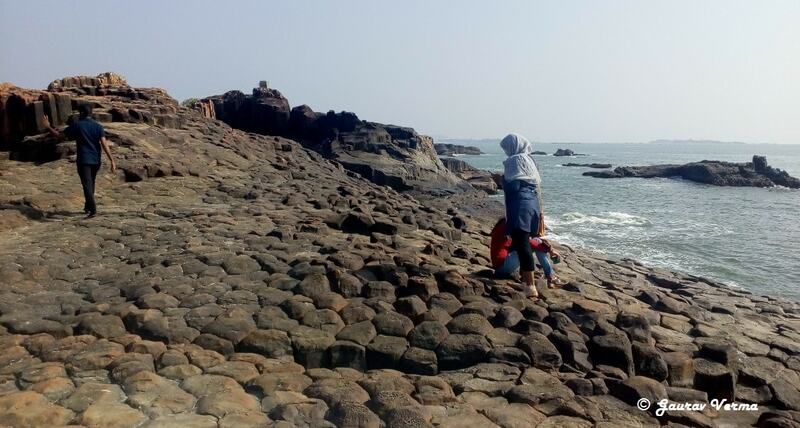 Bhimunipatnam, also famous for serving as the backdrop for many regional movies, is picturesque as far as the eye can travel. Submarine museum, only one of its kind in the world. Everyone has his/ her ways to enjoy the gift called "LIFE". Some prefer hanging out with friends, some like discotheques and some prefer travelling to distinct locations to seek enjoyment. Apart from enjoyment, travelling is an ideal way to recharge your energy stocks. I too fall in the latter category and I honestly believe that you need not going to Bahamas or Paris to seek rejuvenation: "just look around yourself, pack your bags and start". Here lies the advantage India. India is such a diverse country that if you try to explore, you can go to any city/ town or village I am sure you would not be disappointed. 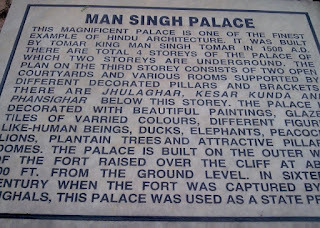 This I believed during my trip to Gwalior. This was my 2nd trip to Gwalior. 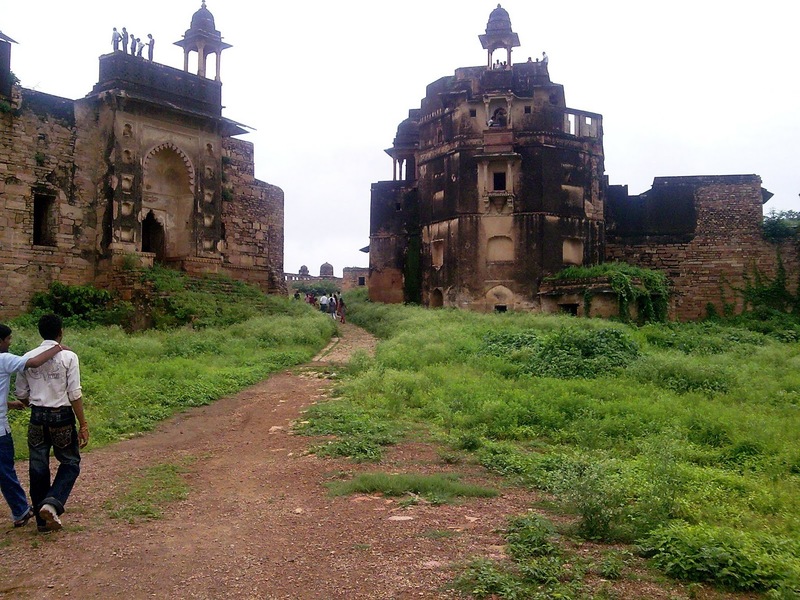 First visit was too hectic, so this time I kept some time for exploration, as Gwalior has a rich heritage and legacy. 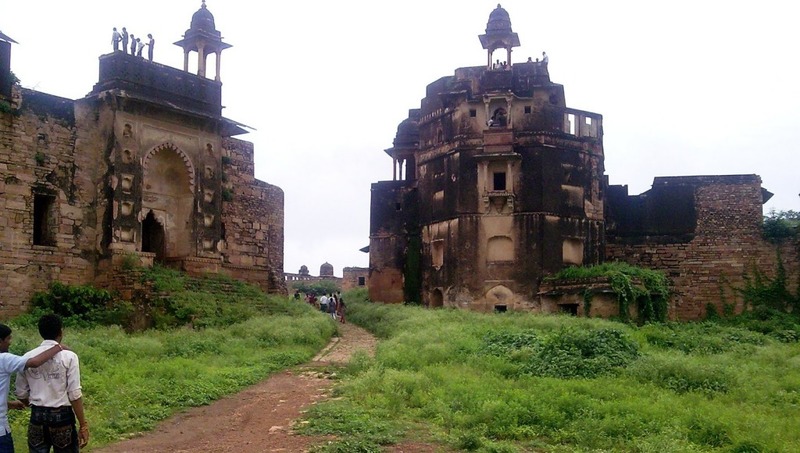 This city has been a witness to numerous curves of the India history. This was the time to opt for our National transporter. You guess it right, Indian Railways. There are numerous trains at all times during the day and it takes only 5 hours to reach Gwalior from New Delhi. During the trip you can enjoy photography from the moving train. 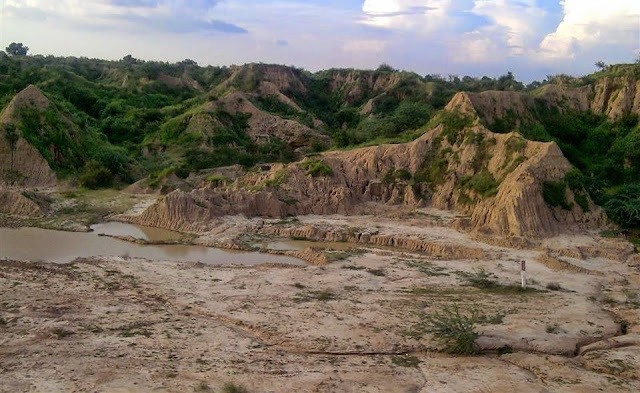 Being the time of monsoons, this was the time to witness "Chambal Valley" in a new water soaked manifestation. 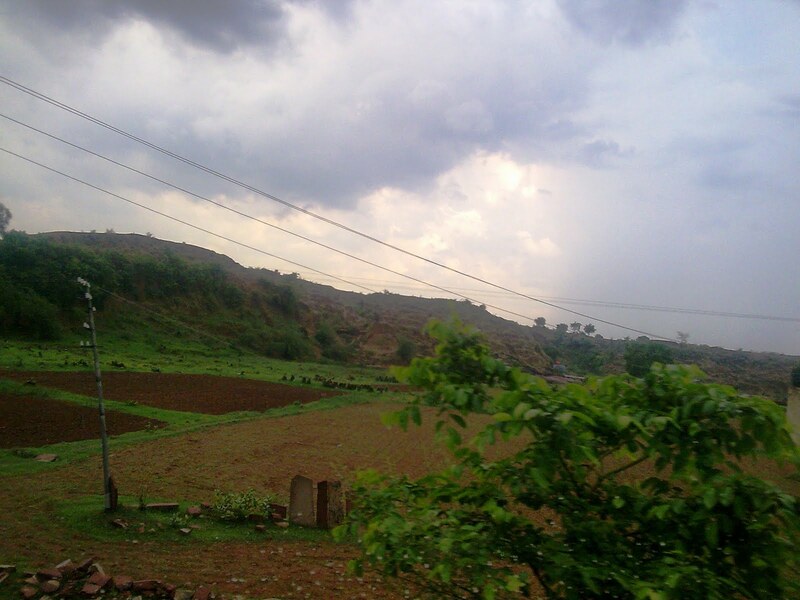 Rains have changed the all round appearance of the Valley. How beautiful was my valley, guys wait for a second, there was the river Chambal itself, with its all overwhelming beauty to leave you astonished. 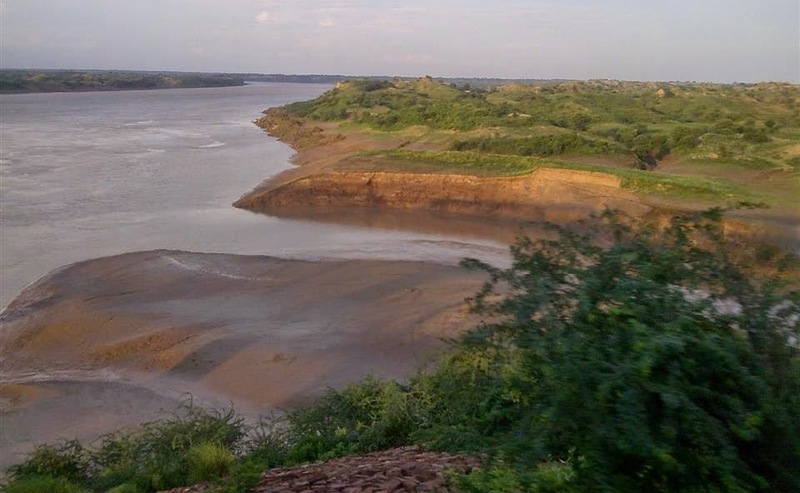 Chambal ravines also have numerous offbeat destinations to visit in Madhya Pradesh. Most notable being Mitawali, which is believed to be the inspiration behind the design of Indian Parliament house. Next day was fully reserved for the sight seeing in and around Gwalior. As I always say every trip is different, this time I got a Bike to move around the city. The first spot in the line was the "Tighra Dam". 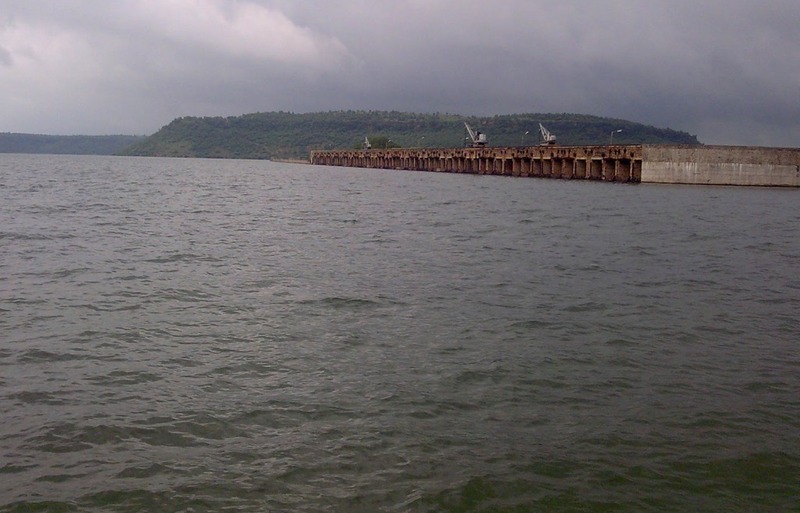 Tighra Dam was constructed in year 1917 and is 23 km. away from the Gwalior City, in stone masonry in lime mortar. The road is in good shape and there are some adjoining hills too. The surrounding hills and landscapes are pretty ordinary, however slowly drizzling rains had turned the ordinary drive into an extra ordinary. Try biking in the rains, it's amazing. While biking in the rains I have forgotten that I was not keeping well for sometime. Road to Tighra and the rains have fully rejuvenated me and all of a sudden I was not tired anymore. 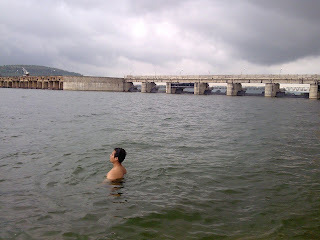 It did not took us much time to reach the dam. Tighra dam is an artificial reservoir of water and it has been nicely developed as a picnic spot too. No surprises it is crowded at all the times. 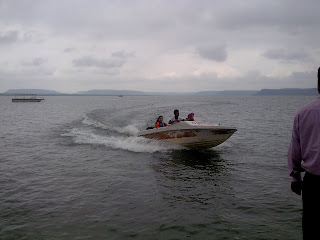 However if speed scares you, than roam around in a pedal boat. The place is small, but it can drench you with oceanic feel. So guys no need to go to Indian Ocean or Bay of Bengal. After relaxing for a couple of hours we again started for our next target, "Gwalior Fort"
Built in 15th century AD the Gwalior Fort has been described as Pearl in the necklace of India Forts by various rulers and inavders too. 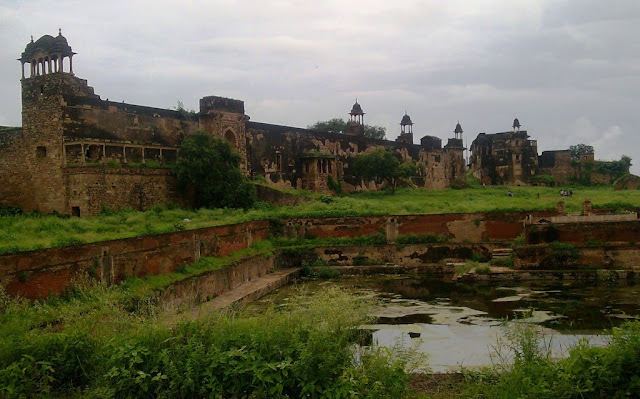 Being one of the largest forts in India it has long been respected as the pride of the rich Indian heritage. Sheer size, colossal manifestation and grand architecture of this fort will surely enhance the pride quotient for the glorious past of our country. 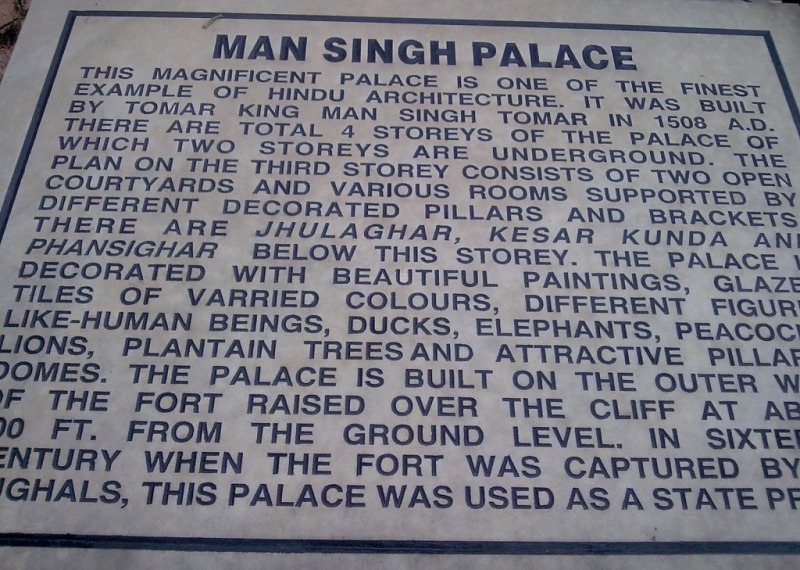 Apart from the visible sprawling structures, there are also 7 stories which are below the ground. 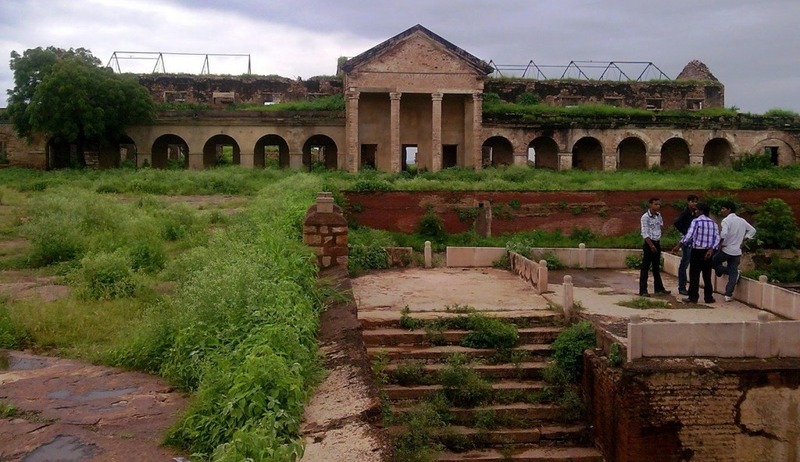 These 7 stories palace which are under the ground are known as "Bhool Bhulaiya". All the walkways, stairs and rooms are alike. Treading alone and without a guide, you are definitely going to lose the way. Moreover there is no lighting inside, in order to preserve the original character of the fort. so follow the instructions. There is always another side to the coin. Which was once the pride of this region, is now counting its last breaths and appears to be totally helpless and lonely in its fight for survival. It hurts and pains at the same time. We are at fault for ignoring the masterpieces received from our ancestors. 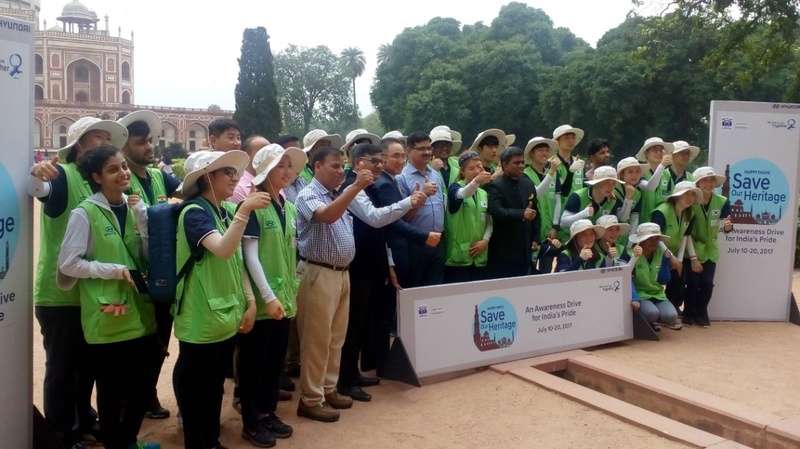 Much is required from government and everyone else who is visiting this fort to keep it alive so that future generations don't miss out a handshake with our glorious past. 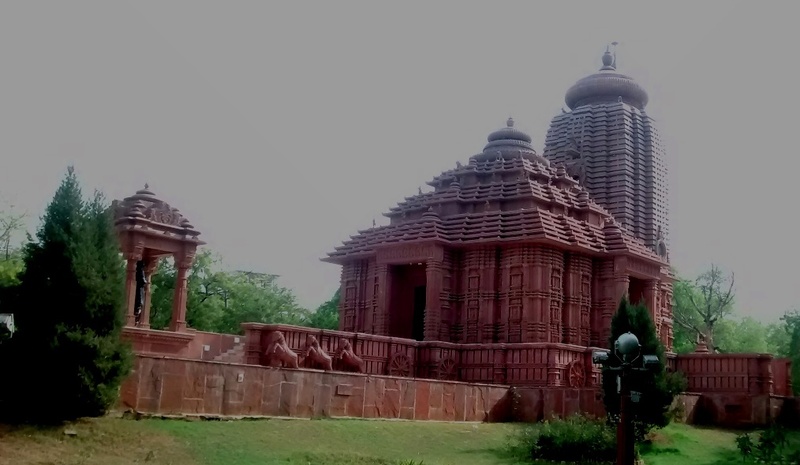 There is also a Sun Temple in Gwalior. As the name suggests, it is an inspiration from Sun Temple at Konark. The carvings on the stones is noteworthy. Being one of the older cities in India, Gwalior is surely a shopping delight too. Gwalior cuisine will surely delight you - don't forget to try Kachaudi (locally called as Bedain), Laddu, variety of snacks and Ghewar (घेवर) - all are finger licking yummy. Far from the Madding Crowd... when you feel to break all shackles and merge yourself into Mother Nature, come to "Jayalgarh"
"Are you not enthralled with the pics, if YES just wait. 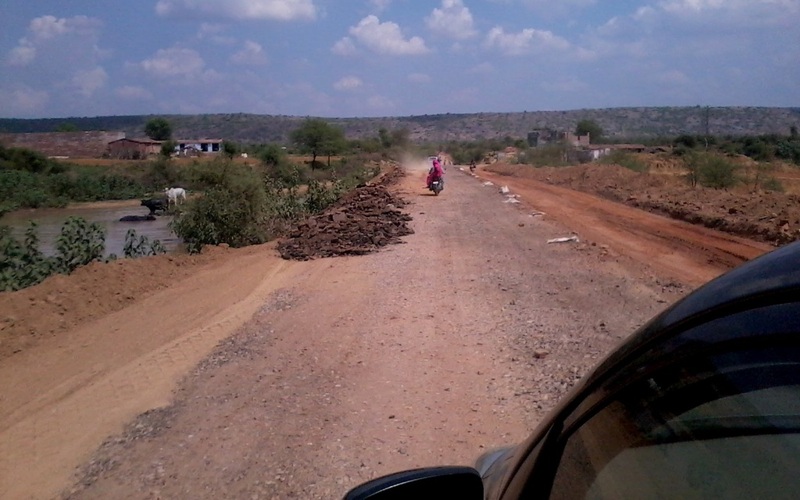 These are just on way to Jayalgarh". 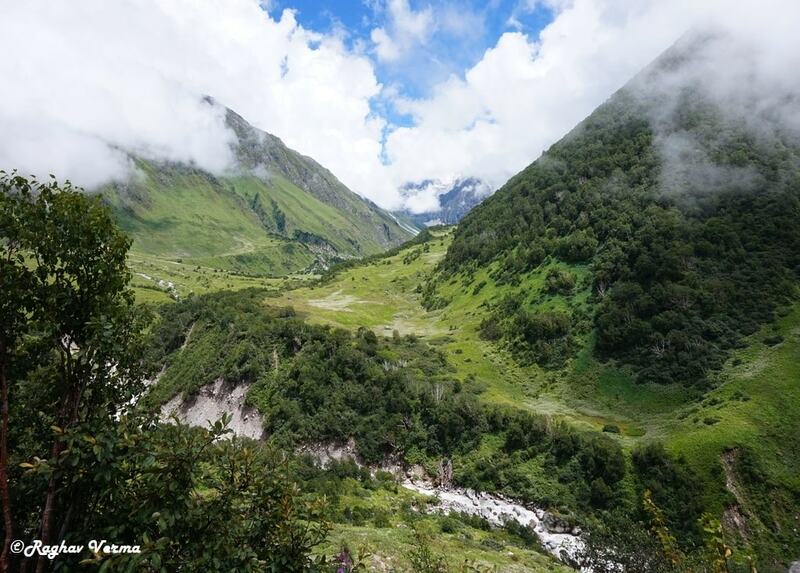 What's waiting for you is the gushing Alaknanda, innumerable treks, trails and rock formations in the nearby mountains. 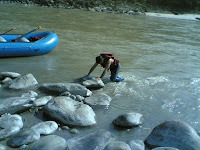 Jayalgarh is approximately 90 kms from Rishikesh near Devprayag. Pitched up on the bank of the gushing River Alaknanda, this would be a wonderful retreat for the entire family, a group of friends or just for you. This is a story of 2 friends (Gaurav and Gaurav), their friendship, their adventures. In the summers of 2006, they boarded a late night bus from Delhi to Rishikesh. It took them around 6 hours to Rishikesh. Another 1.5 hrs. from Rishikesh and they were in jayalgarh at early morning 7 AM. They missed out several ATM's in the way in hope of finding the most coveted ATM in Rishikesh, which was non-existing. Mighty Alaknanda and the Himalayan ranges were there to receive us. De-boarding the bus, the first things we noticed were the camps alongside the river. In no time we were there, inquiring about a possible accommodation for both of us. What we get to know was "The camps have been booked by a company ALSTOM, our last company and they were to arrive any moment". Next momemt we were running out of the camps "Paaji sir pe pair rakh ke bhaag lo". At the same time both of the minds were busy in devising ways to surprise encounters with Alstom. We got a resort just above those camps. After our breakfast, with our binoculars, cameras and preparation we were ready for trekking on naked mountains and testing the strong currents of Alaknanda. Next 2-3 hours were the time of our lives, as we totally drenched ourselves to the rigors of trekking with bare hands and no equipment at all. What a time it was? With our souls we finally conquered the mountain and halted only after reaching the top of the cliff. After this adventure, we thanked to GOD in a temple on the clif. Also chatted with local children, the joy we missed staying in cities. Now we felt to replenish our energies. After the lunch in our resort, the moment we sat down to rest, we fall unconscious for next 3-4 hours. On getting up in evening, filled with adrenaline we started to explore further and left for SRINAGAR (this one not the one in J&K) for another temple visit. In the way we made sure to arrange spirits to keep us in good spirits. 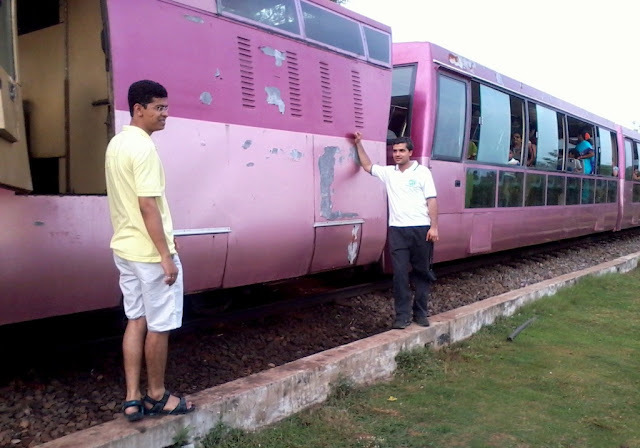 While coming back, we managed to give Alstom a sight of things to come (You know Gaurav, what I mean). "Travellers never think themselves of being foreigners" was our mantra. The road we chose to wait for a bus to take us back to jayalgarh was worth every minute even it had started to dawn and finally one localite offered us the lift to our resort. After the dinner, we again set out for night walk on totally dark roads, only light was from our mobiles. Our previous bosses, the reaction seems they wanted our blood. But we were the merrier ones interacting with our old friends. We shared the same bus and again came to Srinagar to start our rafting. We saw lion hearts crying like babies a midst of river. Even some were so horrified they needed water to regain the senses, when there was water everywhere. Water going down in a gush, raft overturning, screams we witnessed/ enjoyed all. But the most we had a duel with the river Alaknanda, check out the brave soldier in me. All good things have to end, so was with our exploits on reaching jayalgarh. But we still looking around to have some more moments, we picked up a Kayak to try our hand at that also. We also tried our hand at Volleyball and when everything else got over, we decided to call it a day. We started in evening, enjoying the TEA and snacks at roadside dhabas. Adventure was still very much with us in our spirits. We had dinner in Rishikesh and by Sunday morning we were back in Delhi. This has been our close to heart memories, we will talk of it rest through out our lives. We will keep coming to Rishikesh...At this time we have come much ahead in our personal and professional lives. Beauty is in the eyes of the viewer…Experiences of scorching sunlight makes the joy of a pleasant evening unparallel…Many people find beauty everywhere while some keep on complaining and searching for it. One fine day I realized that of late I have been meandering only in the hills, lush green valleys to take pleasure in heavenly breeze and holy river waters. India is a land of diversities: Lush green valleys to barren lands, Snow capped mountains to scorching deserts, sparkling rivers to oceans…there is everything to everyone. Better late than never, As I always say Good travelers never plan in advance. As soon as I decided for the sandy and colorful Rajasthan…my car was ready to explore the colorful Rajasthan all the way to the holy temple of Kaila Devi. Route is fairly simple: Delhi - Mathura (150 km.) 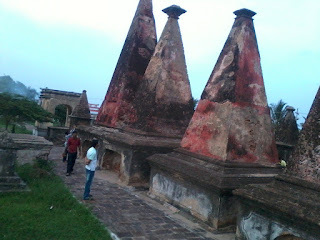 - Bharatpur (190 km.) – Mahua (255 km.) - Hindaun (290 km.) -Karauli (322 Km.) – Kaila Devi (345 Km.). Road is in fairly good condition and exquisite charm of Rajasthan will keep you in lively sprits. 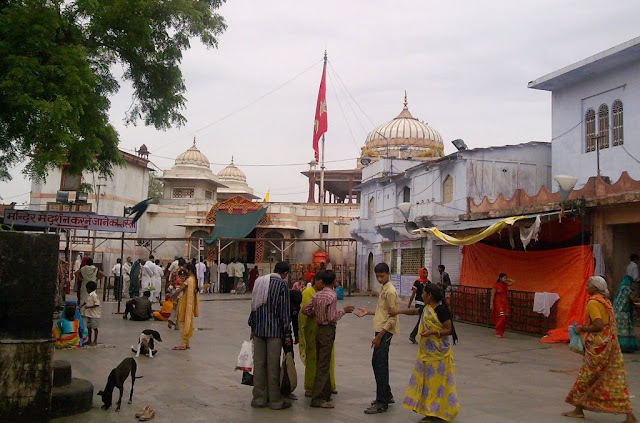 The Kaila Devi Temple was constructed in the year 1100 AD and is situated at a distance of 23 km from Karauli town. 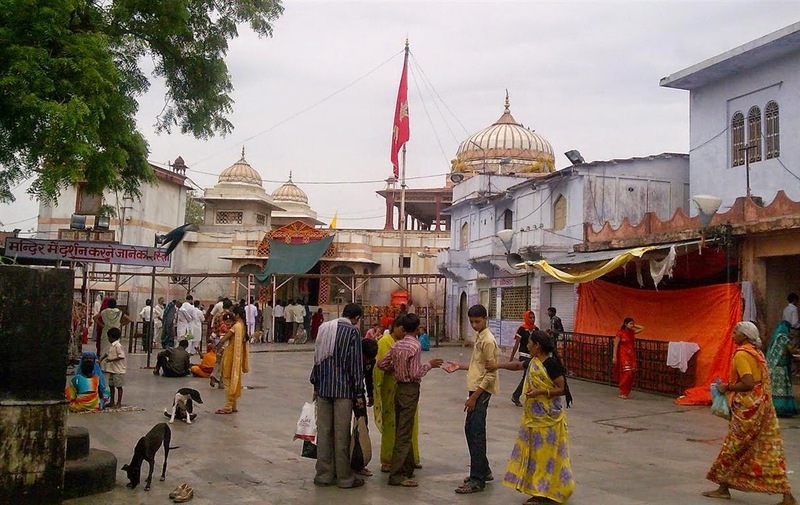 Thousands of devotees from all over the country and from all communities visit this temple, as this place is considered to be one of the 9 Shakti peeths of Hindu religion. At times you will get the feel of being on a Road Safari. I mean the places where this is no proper road. 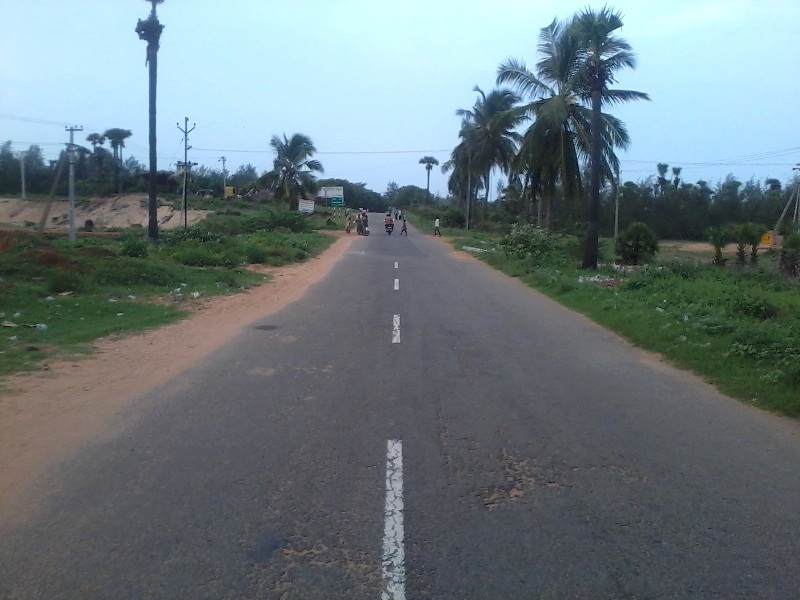 Check out this road; there in proper surface, however driving is as smooth as any well surfaced road. The red sand in this region though is very rough in appearance but it gets hardened like a perfect road surface by even a small downpour of water. Nearest railway station to Kaila Devi is Hindaun. One can take State roadways buses or taxis, which ply at regular timings and fares are pretty reasonable. If you are a driving enthusiast, only 320 Km. separates you from Delhi. If you are looking for 5 STAR comforts here, you will be disappointed. The best accommodation you can get here in “Narsi Guest House”. Narsi Guest house is the biggest one here and is reasonably well maintained and to my joys parking too. Well I was very happy for my car...However there is no option of prior advance booking, but do try your luck whenever you go. We were fortunate to get accommodation in the Narsi Guest House. All the streets lead to the temple of Kaila Devi, however we chose this way. This place dates back to 1100 AD, so you will find a lot of ancient architecture. This structure has not crumpled even an inch for centuries, a benchmark for present day architecture and construction. 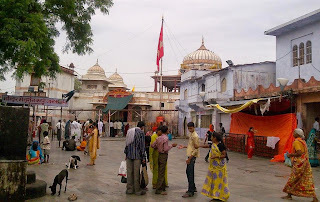 One of the most venerated fairs of Rajasthan, Kaila devi fair is held here in the month of Chaitra (according to the Hindu calendar), for fifteen days in March or April. It is held in the honor of the deity Kaila Devi (a form of Mahalakshmi, the goddess of wealth and Chamunda, the goddess of death). I was amazed to see some of the devotees covering the distance to the temple in a very peculiar way. They were lying prostrate and marking lines with their hands at that position, then getting up and moving up to the drawn line and again repeating the procedure. Locales told me that this ritual is called 'Kanak-Dandoti' and is observed by staunch devotees. This is the power of faith and devotion by virtue of which these devotees endure hunger, thirst and exhaustion for even 15- 20 kilometers till they reach temple. You can see a large number of saints and pilgrims from all the beliefs and traditions at all times here. One can also observe tribal people performing dances of happiness and singing songs in the praise of the deities lending the gaiety to the environment. 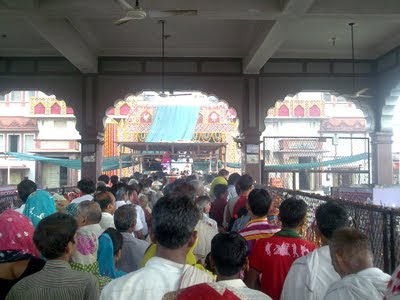 Mass prayer to the Goddess is also organized by the temple twice in day at 7:00 AM and 6:30 PM. You have to be the part of these prayers to experience the electrifying atmosphere. Let your soul immerse in the divine spirituality of this place. 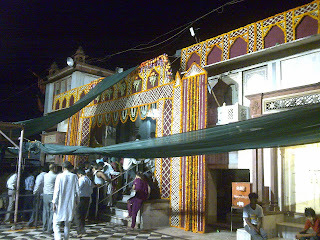 Power of faith here is immense; even I went there twice in 2 days to seek blessings of the Goddess. Day or night, rains or scorching sun nothing can dampen the spirits of the devotees. Irrespective of their status everyone is lined up to seek the blessings. During the evening prayer the ambience of the temple is amazingly exuberant with the holy chants, can not be missed. Don’t forget to visit the temple of Bhairon, located in the courtyard. 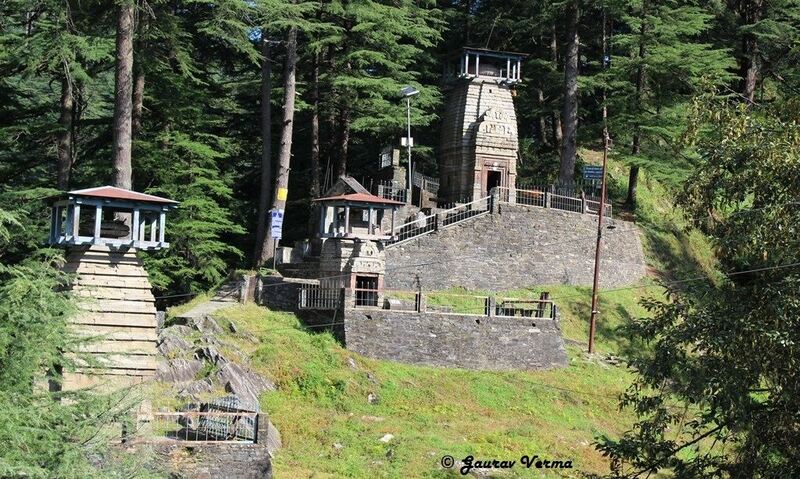 Also there is a “Lord Hanuman” temple, facing the Kaila Devi shrine. Lord 'Hanuman', is also called 'Languriya' in the local talks. 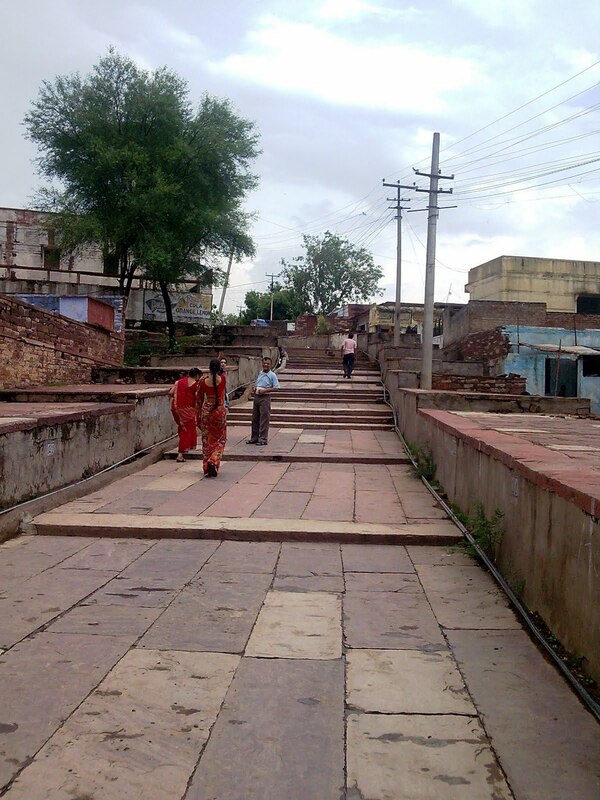 Since Kaila Devi is located along the banks of Kalisil River, you can also enjoy a quite walk along the river side. Why only walking, sitting one can also take a bath in the black waters of the river and join these devotees..
Black waters...? “Kalisil” stands for “Black layer of Stones”, river bad is made of black stones, due to which the water appears stark black in colour. The view from the riverside is panorama par excellence. Photographers will definitely enjoy this. Thanks to Goddess Kaila Devi, for the first time in my life I came so close to the peacocks, our National Bird. These birds are much more beautiful than our imagination. You will find a lot of peacocks here, preserved due to local people worshiping Peacocks as sign of good luck. "Life is made of moments, beautiful moments"
Peacock is an endangered bird and is facing severe perils of getting extinct. It was utmost heart breaking to see these birds trying to adjust to the new environment full of garbage, which is the outcome of human activities. We should stop encroaching in its natural habitats, without the vibrant colors of the Peacocks our earth will appear too dull. Sorry folks, I forgot about the food....but such is this place that you would not feel hungry too often. This I realized when it was the time to have dinner. There are number of local eateries run by the locales. However take care about the hygiene factor. If you can afford walking till “Narsi Guest House”, you can get very reasonably priced and delicious food. Enjoy the charm of having the food served in the plates made out of leaves. And and and...Do not miss the appetizing “LASSI” in the earthen pots called “Kulhad” in local dialect. One earthen pot was almost equal to the dinner. Vow…I had a hefty dinner. After dinner we set out for a quite walk around the place. Umbrella of the clear blue skies with distinctly visible stars had mesmerized us. In Delhi we hardly get to see more than 5-10 stars. I got up early in the morning, to have a marvellous view of the Aravali ranges from the terrace of Narsi Guest House. After one more round of praying and seeking blessings from the Goddess Kaila Devi, we decided to return back to Delhi. The place is magnetic as we found it very difficult to start the return journey. 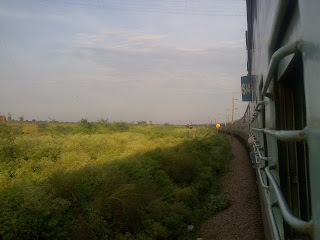 Return journey was as eventful as we were able to enjoy a few missed out charming landscapes. 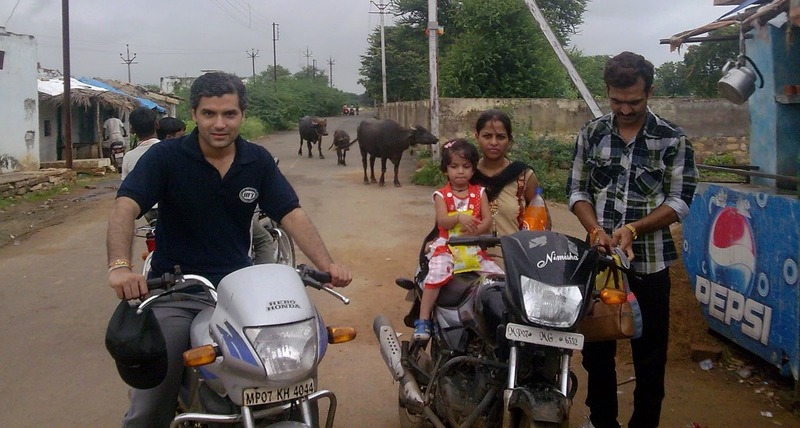 This was the trip that took me closer to the real India. Despite being the economic powerhouse, there is an India where people has to walk miles to fetch drinking water. Though our highways are getting better day by day and the speed of the cars is increasing rapidly, but we still have to go a long way before we call ourselves a developed India. Without any doubts, I will come again...Hopefully the next time I will see the much developed India.